LOS ANGELES, CA--(Marketwired - Dec 8, 2015) - Much more than a luxury office space catering to the needs of the entertainment industry, the Hollywood Production Center strives to build a thriving and successful business community. In addition to helpful amenities, services, and networking events, Hollywood Production Center provides essential business resources. For example, the website offers access to a job board where companies from all industries can post available positions and where potential applicants can review and apply directly online. Convenient, effective, and easy to use, the board allows companies to find the right people for the jobs they need to fill. To view the job board for yourself and see how it can help your business locate the best applicants, simply visit www.hollywoodpc.com/careers. The Hollywood Production Center is grateful to have such amazing tenants. 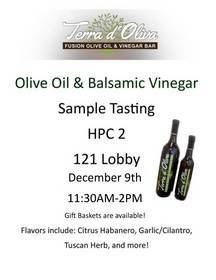 To show their appreciation, they have invited Terra d'Oliva to come in and offer a special tasting of balsamic vinegars and olive oil fusions on December 9 at the W. Lexington Drive location in Glendale. A second sampling taking place on December 10 at the Glendale, E. Broadway location. This tasty break in the day is the perfect way for tenants to step away from their desks as they get a chance to meet local business that come to share their passions.